The holiday season is stressful, so roll out all that tension in your back and beyond with this $18 Gaiam Foam Roller, down to its lowest price ever. 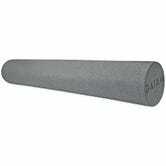 Foam rollers are a secret weapon of workout fiends for pre-workout loosening up or post-workout soreness reduction. Or just skip the workout altogether and lay on top of this thing for a nice spine stretch. Why Does A Leader Of The Indonesian Genocide Get To Play In So Many PGA Tour Pro-Ams?